How To Setup SolaimanLipi Bangla Font In Bangla Blog? Home > Blogging > How To Setup SolaimanLipi Bangla Font In Bangla Blog? There are lots of Bangla blog available in the world and they are performing very well. Millions of readers in Bangladesh and many other countries around the world read Bangla blog daily. As all Bangla content publishers know that the best browser friendly Bangla font script is UniJoy which allows to write Bangla language almost from all keyboard. UniJoy is a typing input system to type Bangla Unicode based language. Almost all web browser supports Bangla UniJoy font. This font is not customizable unless you install custom Bangla web fonts into your blog template or source code. SEE ALSO: Google Adsense Now Supports Bangla Blog And Websites. You can see the difference between these two font style in the below picture. So, if you are a Bangla language blogger you can setup “SolaimanLipi” Bangla font in your blogger template or your website source code. Surely, the new look will be more friendly for your readers to read your posts. 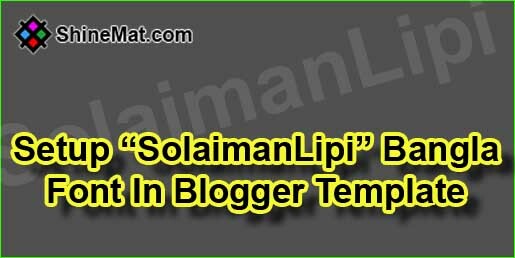 How To Setup SolaimanLipi Bangla font in blogger template or webpage? 2. Go to Theme tab from left side menu. 9. Just replace all of these code with the below code. 10. After replacing all, just click Save Theme and you are done. Now go to your Bangla blog and see the magic of Crystal Clear Solaiman Lipi font style. Hope this post helps. If you like this post please share and drop a comment of your opinion. I will be with your very soon with a new post. Till then stay well and have fun pals. Allah Hafez.